Laser ablation of polymers has been studied with designed materials to evaluate the mechanism of ablation and the role of photochemically active groups on the ablation process, and to test possible applications of laser ablation and designed polymers. The incorporation of photochemically active groups lowers the threshold of ablation and allows high-quality structuring without contamination and modification of the remaining surface. The decomposition of the active chromophore takes place during the excitation pulse of the laser and gaseous products are ejected with supersonic velocity. Time-of-flight mass spectrometry reveals that a metastable species is among the products, suggesting that excited electronic states are involved in the ablation process. Experiments with a reference material, i.e., polyimide, for which a photothermal ablation mechanism has been suggested, exhibited pronounced differences. 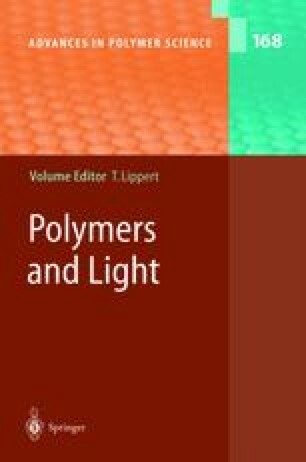 These results strongly suggest that, in case of designed polymers which contain photochemically active groups, a photochemical part in the ablation mechanism cannot be neglected. Various potential applications for laser ablation and the special photopolymers were evaluated and it became clear that the potential of laser ablation and specially designed material is in the field of microstructuring. Laser ablation can be used to fabricate three-dimensional elements, e.g., microoptical elements. This work was supported by the Swiss National Science Foundation. I thank Macarena Montenegro, PSI, for help with the literature database and Katharina Meissner for help with the figures.